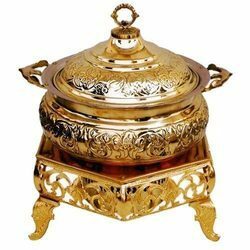 Prominent & Leading Manufacturer from Moradabad, we offer antique chafing dish, brass chafing dish, brass chafing food dishes, stainless steel chafing dishes, silver chafing dish and chafing dishes. 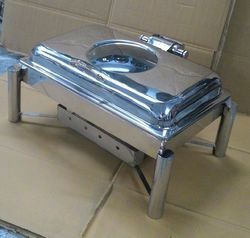 Available with us a wide range of Antique Chafing Dish. Our range of products is ideal to serve hot and ready to eat foods instantly to a large number of guests. These products are hygienic and ensure that the food remains warm for a long time. The products offered by us are developed as per the latest market trends. 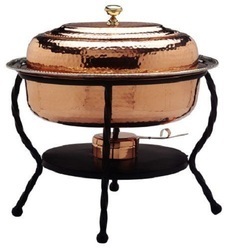 We are a reputed manufacturer, supplier and exporter of an assortment of Brass Chafing Dish. These products keep the food warm for a long time. The entire range of products is tested and checked by our highly skilled and qualified team members, who have a vast experience in this field to meet the industrial standards. We also offer these products as per the customers’ specific requirements. We are offering our clients with the best range of Brass Chafing Food Dishes. These products are widely used in several hotels, restaurants & other food joints and these can hold larger quantities of food. The offered range of products are ideal to store food and keep the same warm for a long period of time. Our products are also available in numerous shapes, sizes and designs to meet the variegated demands of the clients. 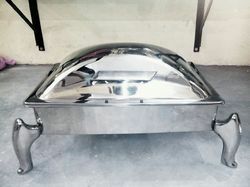 We are offering our clients with an impeccable range of Stainless Steel Chafing Dishes. 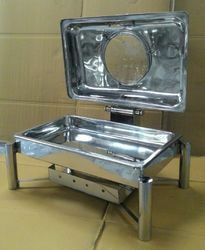 These products are widely used in restaurants, parties, wedding ceremonies and some other occasions to serve the guests. Our products are designed and developed to the perfection and reflect an elegant appeal to the clients. 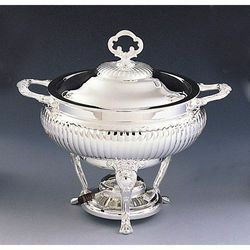 These Silver Chafing Dishes are available in different design and styles that are made according to the demand of client. These Dishes are used for buffet dinners, wedding meals or meals that are organized for conferences or seminars, parties weddings etc.These chaffing dishes are made in different metal and finish.